Mr. Hill focuses on providing merger and acquisition, financial advisory and capital raising services to West Coast community banking institutions. He has over 45 years of investment banking experience and has for the last 32 years specialized in providing a full range of investment banking services to community banking institutions. 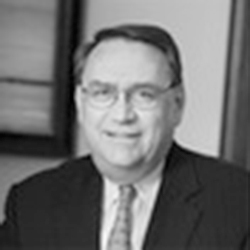 Prior to joining Hovde, Mr. Hill was a Managing Director at Friedman, Billings, Ramsey in the firm’s Irvine, California office. Mr. Hill was also previously Managing Director and Head of the Financial Institutions Group at Sutro & Co., Incorporated in Los Angeles, Senior Vice President at Ryan, Beck, & Co.; Managing Director and Head of the Financial Institutions Group of Paine Webber Incorporated; Director-Finance in the Financial Institutions Department of Salomon Brothers; Managing Director in the Investment Banking Department of Warburg Paribas Becker; and a Vice President in the Corporate Finance Department of Smith Barney Harris Upham & Co. Mr. Hill is a frequent speaker at various industry and professional events and has written articles in industry publications regarding topics specific to financial institutions. He is a 1967 graduate of Harvard College and received his M.B.A. in 1969 from the Harvard Graduate School of Business Administration. In addition, Mr. Hill is licensed with the Financial Industry Regulatory Authority as a general securities representative and general securities principal and holds the following licenses: Series 7, 63, 79, and 24.